I didn’t do a favorites post last month because I was so busy I didn’t have much time for anything. And while November was still fairly busy I had a few things that I feel are worth mentioning since I absolutely would consider them current faves. When this palette was first released last month I was a bit meh about it. There were a few colors in it that caught my eye but because of the plethora of neutral shades I didn’t feel like it would add anything to my eye shadow palette collection that I don’t already own. But I kept seeing photos of it…and they kept drawing me in. I finally watched a few YouTube reviews of the palette out of curiosity and was persuaded my beautiful eye looks and raves about the formula to purchase it. That and the fact that Ulta had it on sale for $10. This palette is beautiful. I’m sure many of you already have some of these colors in your makeup collection - I certainly do. But the formula is great and the neutrals all have interesting undertones. For instance Emperor in pictures simply looks like a basic warm tan. In person it has a really pretty yellow almost mustard undertone. The shimmers and metallics in this palette are beautiful as well. And there are a few that are really unique and unlike anything else I own. I’ve created really pretty berry looks and really soft neutral looks. One of my fave looks with this palette is taking Emperor all over my lid, deepening the outer corners of my eyes with a mix of Majesty and Prince and highlighting my brow bone with Palace. I pop on a bit of mascara and it’s a great “no makeup makeup look”. I raved about this foundation before and I’m still in love with it. I had stopped wearing it for about a week but wasn’t happy with how my foundation was looking at the end of the day. I was worried that the matte finish would be too drying for the colder days but it really hasn’t been. My makeup still lasts the entire day and it stands up well to my oily skin. It doesn’t break down or separate. I’m more than halfway through the bottle I own and I purchased it in September. It usually takes me ages to get though a bottle of foundation because I switch mine up so often. I am soooo late on this one but what can I say? I’m slow but I eventually get there. This show has been on my list of “shows to eventually watch” since it premiered in Spring of last year. I spent a lot of time in November catching up on all the shows I wanted to watch or catch up on. I see what all the fuss was about with this show because it’s amazing! It’s utterly charming and funny and surprisingly edgy for the time it takes place in (1950’s New York). I barreled through all 8 episodes in a weekend and was sad when I realized the new season hadn’t started yet. But no worries- Season 2 premieres on December 5th! A new fave. 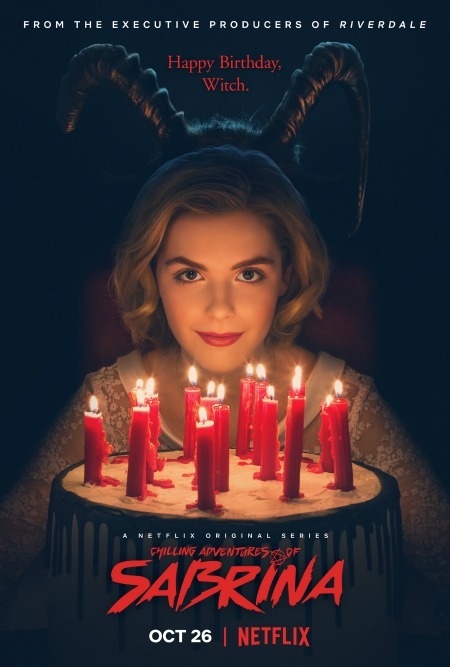 If you are like me and grew up with the original Sabrina The Teenage Witch series then I must warn you that this show is …nothing like that one. Sabrina is still a witch, Salem is still a cat (kind of), Sabrina still lives with her two aunts and dates Harvey. That’s where all similarities end pretty much. I respect the fact that this show is so utterly different from it’s predecessor (this iteration is based on the comic book series published in 2014). If you like dark edgy shows with complicated villains and complicated heroines this is the show for you. I have been a loyal Almond milk drinker for years. But recently another non-dairy milk has come along and stolen my heart. The barista in the coffee bar in my office building randomly recommended I try oat milk in my chai latte one day and I did. Life changed. The texture is lovely (not too thick but not overly watery either), and what I love most about it is the really mild flavor. You can taste it but unlike Almond milk it won’t change the flavor of whatever you are using it in. It can be hard to find so I was pleasantly surprised to discover that Target carries it in stores. So goodbye Almond milk, it was nice while it lasted but I’ve found someone new. Short and sweet favorites for November. I have a feeling December will have a lot more going on - especially in the makeup department! We respect your privacy. We do not share emails with outside sources. That’s so uncool.